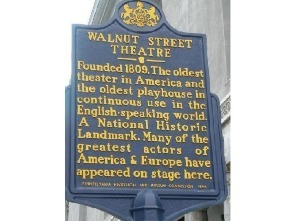 The Walnut Street Theatre, located at 9th and Walnut Streets in Philadelphia, is considered to be the oldest playhouse in America, as well as the oldest continuing theatre in the English-speaking world. It has been serving Philadelphia with a large variety of entertainment since 1809: circuses, vaudeville, opera, motion pictures, lectures, music, dance, and most significantly, live theatre productions. American Victor Pepin and Frenchman Jean Baptiste Casmiere Breschard built the theatre in 1808 and it opened on February 2, 1809, beginning its successful business as an equestrian circus. A few years later, an 80-foot dome was added, making the building Philadelphia’s skyscraper at the time. By 1812 the building was transformed into an authentic theatre, and in 1820, the dome was removed- one of many renovations done on the building. The first theatrical performance was “The Rivals” in 1812, with notables such as the Marquis de Lafayette and Thomas Jefferson in attendance. Edwin Forrest, one of the most famous American actors of the nineteenth century- the “Brad Pitt of the 1800s”- performed at the Walnut when he was fourteen years old. He became a frequent and legendary performer at the Walnut, which is evident by the 11-foot statue of him in the lobby of the theatre. The statue resembles Forrest costumed as Shakespeare’s historic character Coriolanus. During the Civil War, the theatre was used as a recruiting arena as well as entertainment for officers and officials, no matter their rank. In the post-Civil war period, in 1863, Edwin Booth and his brother-in-law John Sleeper Clarke purchased the theatre. The Booth family was one of the most well-known actor families in America at the time. Two generations of the family performed at the Walnut. The most infamous member of the family, John Wilkes Booth, known for assassinating President Lincoln, never performed there. Lincoln’s assassination at Ford’s Theatre in Washington, D.C., cast a shadow on all theatres in America, and theatres throughout the country were closed the following week. 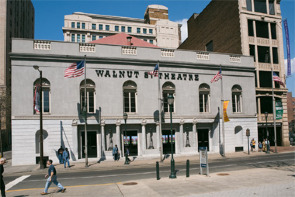 In the 1960s and 70s, the Walnut was restored by architects Loving and Dickey into the theatre's 1828 “Greek Neo-Classic Federal" style. Except for the grey marble, it is an exact duplication of the 1828 theatre. Even the current backstage at the Walnut is true to its initial framework. It is one of the only “hemp houses” in the country, meaning that its rigging system is done by force rather than being counterweighted. The sandbag system is still in operation, a system that was in use two centuries ago, as well as the original grid, rope, and pulley. Despite these traditional methods, the Walnut is also known for being progressive in other ways, as it was the first theater to install gas footlights in 1837 and the first to install air conditioning in 1855. On the stage that is still in use today, Groucho Marx announced to the audience that President Harding had died. Jimmy Carter and Gerald Ford held a televised debate on the stage in 1976, and Ford bumped his head on one of the door frames- people in the 1800s were generally shorter in stature. The Walnut has stayed true to its original structure and purpose in numerous ways. 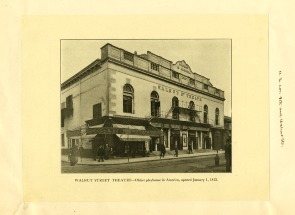 The Walnut Street Theatre was declared a National Historic Landmark in 1964, with actress Helen Hayes accepting the citation from the U.S. Department of the Interior. 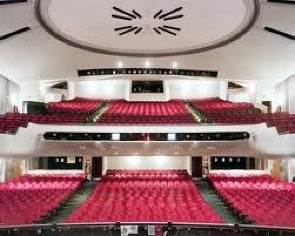 The theatre was then purchased by a non-profit organization in 1969, turning it into a theatre for the performing arts and a home for local drama, dance, and music companies, with a strong policy for community involvement. This vision for the Walnut continues through the early 2000s. The company puts on with five theatrical productions a year on the main stage and has thriving educational programs and opportunities that bring the joy of the arts to the city of Philadelphia and beyond. Over 56,000 people subscribe to the Walnut Street Theatre in 2013, making it the most subscribed theatre company in the world. Kean, Manuel. The Walnut Street Theater : Philadelphia's New Center for the Performing Arts. Philadelphia: Kean Archives, 1971. Weil, Martin Eli. The Exterior Restoration of the Walnut Street Theatre in Philadelphia. [Louvain, Belgium? : s.n., 1976.